With over 12 feet of snow falling this winter thus far in Ottawa there have been many occasions where my sweet 3.5 year old daughter has come inside rosy-nosed and cheeked looking for hot chocolate. Given what I do and my views on sugar and calories, you might imagine that hot chocolate is not on my list of healthy go-to beverages (it's a pretty short list - water). So what's an obesity medicine doctor to do? 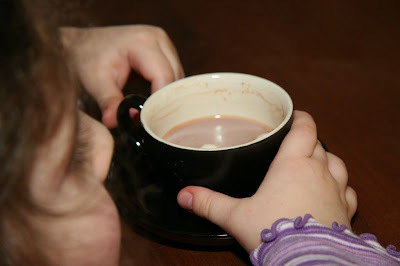 One option which we do when we're out is not care too much - she's a healthy kid, with a healthy weight and a little hot chocolate now and then is part of growing up. Of course in our home, well things are much more controllable and that's where my wife's pre-schooler hot chocolate hack comes in handy. Perfect size for my tiny daughter (who also loves the tiny daintiness of the cup) and provides her with a treat that's quite calorie controlled. So for context, the average "packet" of hot chocolate combined with 6oz of water would contain roughly 120 calorie and 5 teaspoons of sugar. Make it with 6oz of skim milk and now you're up to 190 calories - buy it at Tim Horton's and you've got 240. My wife's recipe - 34 Calories and piles of cute.